Published in partnership with Vox. There is interesting mystery and ambiguity in this statement, however, just as in any spy story. A footnote in Barr’s letter says Mueller defined “coordination” as an “agreement — tacit or express — between the Trump Campaign and the Russian government on election interference.” Note the three key elements: a tacit or express agreement, with the Russian government, about election interference. The wording is important, particularly given how intelligence operations work. And so it is worth parsing this a bit, not only because Trump has declared this means he was exonerated, but also to highlight the lurking uncertainties at a moment when Congress is deciding how hard to press for direct access to the report itself, or at a minimum, to sworn testimony by Barr and Mueller about any hidden elements. Both Barr’s letter and Mueller’s indictments make clear Russian intelligence services aimed to disrupt the 2016 election. Those intelligence operations against our democratic institutions, which persist, operate in similar ways to the aforementioned covert action. They are designed to support and advance Russia’s foreign-policy agenda while hiding the hand of the Russian government. How does an intelligence service hide its government’s involvement? It does this by building into the operation what we call “plausible deniability” – more colloquially known as a cover story. Remember in high school when you sent a friend over to the girl you liked to get a sense of whether she would go out with you if you asked? The friend could claim he was asking out of his own curiosity, to save you from embarrassment if the girl was uninterested. You could claim you never asked your friend to talk to the girl. The girl might guess you sent your friend, but she might not be able to prove it. That is plausible deniability. Your friend was acting as a “cutout” – to hide your involvement – with a cover story, that he was asking for his own curiosity. In an intelligence operation, plausible deniability is a bit more sophisticated. Intelligence officers use individuals or businesses that are not part of the government but are, at arm’s length, working on behalf of the government as cutouts, and they can develop much more complex cover stories by using witting and unwitting foreign agents and front companies. Another country’s intelligence services might be able to uncover some of these cutouts and cover stories. Using their own intelligence methods, they might collect information that points to the conclusion that a particular government is behind those cutouts and cover stories — a task that U.S. intelligence agencies were able to accomplish not only in the case of the Russian influence operation but also in some notorious hacking incidents. Or they might not be able to do this, depending on how well the opposing service did its job. And even if the opposing service does leave some traces, the targeted country could still find it challenging to develop the sort of evidence that a prosecutor could bring to a courtroom. Think of it like this: You’re a detective working on a murder case, and come upon a safe that is smoking and smells of gunpowder. But without being able to open that safe, there is no way to say with certainty that a smoking gun sits inside. The narrow wording of Mueller’s partial sentence that Barr quoted in his letter limits the question of coordination to a “tacit or express” agreement “with the Russian government.” Yet, the Russians’ interventions – which aimed, in part, to help Trump win and to denigrate Hillary Clinton — were surely meant to hide those two elements. This wording leaves open the possibility that Mueller found plentiful coordination with others who were not part of the government but were a step, or several steps, removed. A Russian lawyer such as Natalia Veselnitskaya, who has connections to the Kremlin but is not herself a member of the government, and who participated in a meeting with campaign officials where Russian dirt on Clinton was supposed to be shared, certainly fell into this category. And Mueller’s investigation and public reporting have surfaced a variety of other characters – such as Joseph Mifsud, Aras Agalarov, Rinat Akhmetshin Konstantin Kilimnik, and Oleg Deripaska –who had some Kremlin connections without evidently being direct employees and who were in discussions with Trump campaign officials. 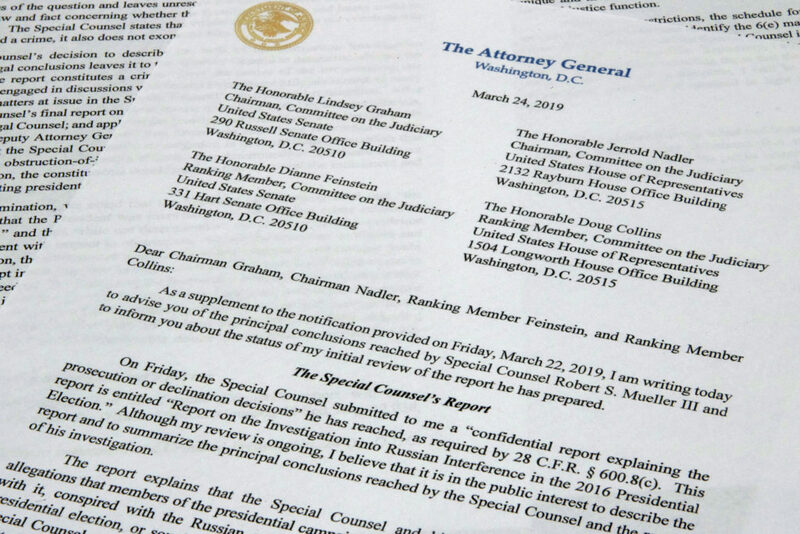 What does Mueller’s report actually say? The bracket around the first letter of the Mueller quote is another small clue that more may be behind the curtain than we’ve been allowed to see so far. “[T]he investigation did not establish that the Trump campaign conspired or coordinated with the Russian government in its election interference activities.” The bracket around the T indicates there is a phrase that begins that sentence. But without seeing the actual report, we just don’t know. And given the public record of the Trump campaign’s contacts with many Russians and its officials’ repeated lies about those contacts, it is difficult to believe Mueller found nothing with national security implications. Barr’s letter also states Mueller did not find anyone in the campaign who participated in the specific crimes of the Internet Research Agency influence operations or in the hacking and stealing of Democratic emails by Russian military officers. But Barr’s letter does not address whether Mueller concluded that Trump or his associates were compromised by Trump’s efforts to build a Trump Tower Moscow, a project that required Russian government approval and was slated to net him hundreds of millions of dollars, at precisely the time the Russian government was running an intelligence operation aimed at helping him win the presidency. Subscribe to get the Center for Public Integrity’s weekly newsletter delivered. Such a project might not amount to “tacit or express” coordination on “election interference,” but the overlapping timing of the campaign and the construction planning leaves open the possibility that Trump was vulnerable to manipulation. An intelligence asset might be unwitting — a “useful idiot” as we say in the intelligence world — but that doesn’t diminish the threat that asset might be to national security, nor negate that he may actively have been used to some end. The president’s son-in-law and senior adviser Jared Kushner told some interns in July 2017, for example, that the campaign was so disorganized or decentralized “we couldn’t even collude with our local offices,” according to Foreign Policy. But intelligence officers are skilled at gaining someone’s cooperation without them directly knowing what they are doing or why — and none of that sort of connivance would be readily prosecutable. The language in Barr’s letter also does not address if Trump made an agreement to change U.S. foreign policy – on issues such as the sanctions imposed over Ukraine — in order to get his coveted tower. Such an agreement would not fall under the narrow definition of “election interference,” and would not even necessarily be illegal, but would still be a grave U.S. counterintelligence concern. None of this is to say Trump is a foreign agent under Vladimir Putin’s control. It’s important to know there is a gray area between “no collusion” and “Trump is a foreign agent.” We don’t know from what we’ve been able to read so far in whose interest he is acting. Even if he is acting in his own interest and solely on his own accord, many of his public actions (and we don’t know how many of his private actions) have fulfilled Russia’s overarching agenda of vilifying America’s institutions and hurting U.S. national security. Supporting, and even publicly encouraging, a hostile foreign power to hack a former secretary of state’s emails is, to say the least, reckless. Mueller’s report likely would help put context to the many disturbing episodes we know about and help the public understand the nature of those meetings and relationships with Russians, from those at the lowest levels to Putin at the very top. Importantly, Barr’s letter says Mueller’s investigation does back up the intelligence community’s overall findings that Russia interfered in the election, an idea Trump has consistently refused to accept. Furthermore, the letter confirms that “Russian-affiliated individuals” made “multiple offers” to assist the campaign. Notably, no one on the campaign ever reported those offers to the FBI and everyone consistently lied about them when asked. We need to discuss, as a nation, if this is acceptable for U.S. politicians going forward. The standard of merely having “no criminal liability” is comically low for the position of U.S. president; other, higher standards of ethics and morality should be discussed. Because Russia’s interference in our democratic institutions involves covert action, designed to hide the Russian government’s hand, drawing a conclusion about how successful Russia was with their many approaches to Trump and his team is difficult without access to the underlying intelligence that Mueller saw and the information gathered from more than 2,800 subpoenas, 500 search warrants, 230 orders for communication records, and nearly 50 orders to monitor phone call records. And given the nature of intelligence, coming as it does from classified sources and methods, we, the public, may never see it. Even if we did, it might not rise to the level of criminality, which is why setting that bar was never going to be satisfactory. Many things intelligence officers from all countries get people to do are not illegal, but they can still be unethical or even dangerous to U.S. security. Our laws also allow all kinds of unethical behavior at the nexus of money and politics. In the end, the question comes down to this: Has the president faithfully executed the responsibilities of the office, free of untoward foreign influence? Without access to Mueller’s report, we cannot say for sure. The only thing that Barr’s summary of Mueller’s report tells us for sure is that Mueller could not establish a “tacit or express” agreement with the Russian government as fact. That is, he did not feel he could prove it in court. This does not mean Mueller found no links between the Trump campaign and the Russian government’s actions. While most have painted this partial sentence to mean Mueller found no evidence of collusion, it actually states Mueller could not find enough evidence to state conclusively, at a level that would stand up in court, that members of the Trump campaign coordinated with the Russian government. 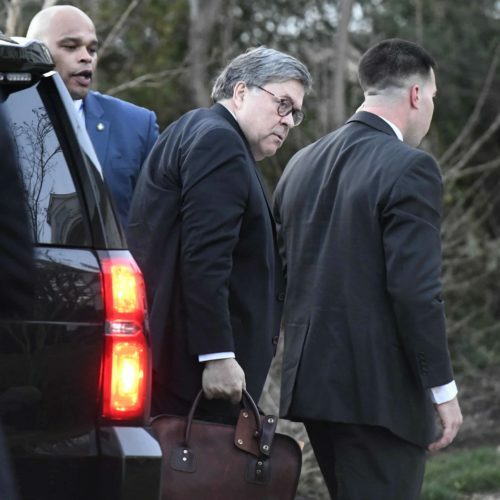 Amid all the lingering questions, one thing is utterly clear from Barr’s summary: Until we see a fuller picture, the president’s “no collusion” victory lap feels premature. Why did the Democrats pay someone to write the FAKE Russian Dossier? Does merely talking to a Russian, who MAY have connections to the Kremlin, constitute a dangerous act? How would you define the degree of guilt of the recent President, who sent private and secret letters to the Ayatollah Khomeini, a leader of a nation that has threatened our death and sponsors terror around the world? If your answer that the President’s has latitude to take actions to benefit America. you must apply the same criterion to our current President as you do to the recent one.